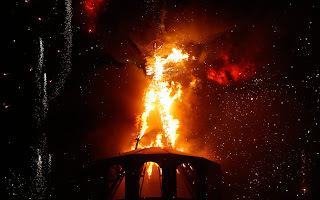 I have never been to the Burning Man festival, but I have an idea about it. People come together in the middle of a blank slate desert, build a "civilization" together, full of whimsey; something new, and different; full of their aspirations and inspiration. Then, they "burn it down" at the end, leaving nothing behind. You can see pictures of this year's festival by clicking on the image. 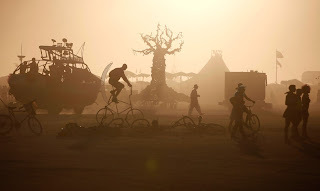 An essay, "What Is Burning Man?" seems largely to validate my own idea. Our real situation is not unlike Burning Man. We build a civilization that reflects our individual and creative energies and efforts. Then, we can (and do) leave that world behind. We can always build another. A good lesson. A reason to celebrate.